Check your emails if you're a Chapters Indigo Plum Rewards member! 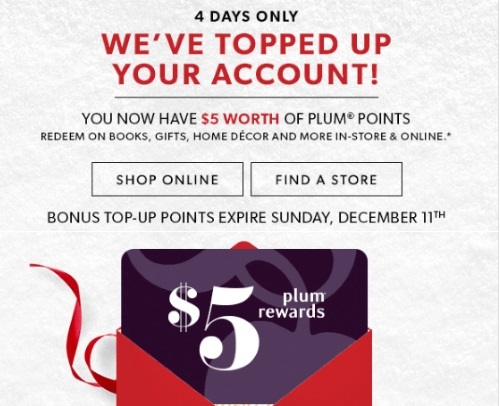 I got an email today that they added $5 worth of Plum Points to my card. I find they tend to do this every year around the holidays to encourage shopping to their store! The $5 can be redeemed on anything in-store and online such as books, gifts, home decor, and more etc. These bonus top-up points are valid until Sunday, December 11, 2016 then they expire. Not a Plum Rewards member, sign up here (top corner where it says Rewards Centre). It's a free loyalty membership that you can sign up for to earn points towards rewards.